"As a man of faith, you are troubled by the thought: what will Providence do with Gandhi? And what is the meaning of the appearance of this strange person among the statesmen and politicians of our time? A warning from God. That is surely the meaning of the leader of the great Indian nation. Through that person, Providence is showing politicians and the statesmen of the world, even Christian ones, that there are other methods in politics than skill, wiliness and violence. Gandhi’s political method is very simple and obvious: he does not require anything except the man who cries out and the God Who hearkens. 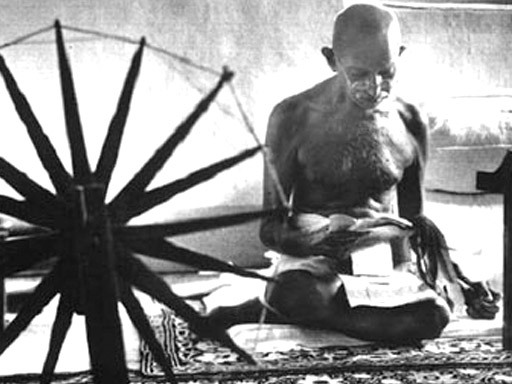 Against weapons, ammunition and army, Gandhi places fasting; against skill, wiliness and violence, prayer; and against political quarrel, silence. How puny and pathetic that looks in the eyes of modern men, right? In modern political textbooks, these three methods are not even mentioned in footnotes. Fasting, prayer and silence! There is hardly a statesman in Europe or America who would not ironically see these three secrets of the Indian statesmen as three dry twigs pointed on the battlefield against a heap of steel, lead, fire and poison. However, Gandhi succeeds with these three “spells” of his; he succeeds to the astonishment of the whole world. And whether they want to or not, political lawmakers in England and other countries will have to add a chapter into their textbooks: “Fasting, Prayer and Silence as Powerful Weapons in Politics.” Imagine, would it not be to the fortune of all mankind if these methods of the unbaptized Gandhi replaced the methods of the baptized Machiavelli in political science? But it is not the Indian’s method in itself that is such a surprise to the world, as it is the person using the method. The method is Christian, as old as the Christian faith, and yet new in this day and age. The example of fasting, prayer and silence was shown by Christ to His Disciples. They handed it down to the Church, along with their whole example, and the Church hands it to the faithful from generation to generation until this day. Fasting is a sacrifice, silence is inward examination of oneself, prayer is crying out to God. Those are the three sources of great spiritual power which make man victorious in battle and excellent in life. Is there a man who cannot arm himself with these weapons? And which crude force in this world can defeat these weapons? Of course, these three things do not include all of the Christian faith, but are only a part of its rules, its supernatural mysteries. The Christian world is the new, baptized Israel. Listen! Is Christ not telling the same words today to the consciences of the Christian Elders by pointing to today’s captain of India? Peace and health from the Lord to you." From Missionary Letters of Saint Nikolai Velimirovich: Letters 1-100, trans. Hierodeacon Serafim (Baltic), Vol. VI in A Treasury of Serbian Orthodox Spirituality. Article published in English on: 2-7-2010.